The amazing doggy sense of smell has fascinated me for years. I’d written about how the military uses this talent so effectively on my previous book, “Dogs on Duty,” and now I had a chance to expand on our partnership with canines that depend on their sense of smell to identify just about anything we’d like to find–a stash of drugs, the poop of an endangered species, the presence of a symptom of illness in a person, even the presence of bed bugs deeply hidden under a hotel mattress–the list goes on and on. 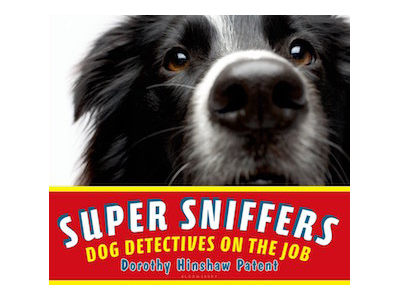 I loved meeting many great dogs and their human trainers and handlers while working on this book, and I’m confident readers will be just as wowed by these talented animals as I am. I teach a course in Humane Education in a public school. The first lesson is How dogs help us. that I plan to buy my own copy, donate one to the school library and one as a gift for my vet. Thank you for all your research that shows how amazing our canine helpers are. Thanks for your note, Ellyn. You might also want to see if “Saving Audie: A Pit Bull Puppy Gets a Second Chance” is in your library. It is about one of the Vick dogs and his efforts to learn love and trust.